» What Are The Best Double Umbrella Strollers of 2019? If you’ve been looking for the perfect double umbrella stroller, have no fear: we’ve checked out the most popular double umbrella strollers and the wannabes, and found you the top 11. You’re looking for so many things: a lightweight stroller, safety, a good price, perhaps car seat compatibility, and something you can use for a while. More than that, though, you wish you had the options available to those searching for a single umbrella stroller. In this article, we’ll examine the seven best double umbrella strollers. To determine which strollers made the list, we compared car seat compatibility, how the stroller folds, its weight, weight limit, warranty, and more. Want to see the technical details? Here are the top eleven double umbrella strollers, in descending order. 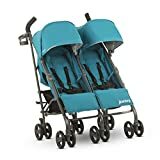 The only stroller on this list offering a shoulder strap, the JOOVY Twin Groove Ultralight Umbrella Stroller is good from birth until 50 lbs, and offers convenient pockets – in the kids’ reach – for bottles, sippy cups and snacks. The leg rests can be pulled up, and there is a “bassinet” option as well. Plus, this stroller offers so many pockets you might even be able to nix the diaper bag. The good: The Twin Groove Ultralight has two convenient canopy windows, a zippered pocket and a mesh pocket on the back of each canopy, a cup holder, and extendable canopies. Also, its canopies are removable. The not-so-good: There’s no bumper bar, and this stroller isn’t compatible with car seats. The best part: The JOOVY Twin Groove Ultralight has a shoulder strap (much easier than a carrying handle), a near-flat recline, and is water-resistant. And, babies can get their own bottles out of the personal bottle-pockets in each seat. Is it for you? If you’re looking for an easily folded, easily carried double umbrella stroller that can hold your babies and all your stuff from day one, this is the double umbrella stroller for you. Good from birth and offering a “bassinet” option, the guzzie+Guss Twice Double Umbrella Stroller allows parents to adjust the seat to a near-reclining position and lock the front wheels. 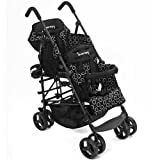 In addition to its large window and a pocket on the back of each extendable canopy, this stroller also has reflective strips for better visibility at night. The good: The guzzie+Guss Twice Double Umbrella Stroller has lots of storage space, a five-point harness, lies nearly flat, and can be used for babies from day 1. Its canopy is also extendable, providing better protection from the elements. The not-so-good: This stroller isn’t compatible with car seats, and isn’t as lightweight as some of the others, coming in at 28 lbs. Also, it’s on the expensive side. The best part: While the other strollers’ bassinet options were fabric, the guzzie+Guss’ is made partly from the footrest, providing a more solid barrier. 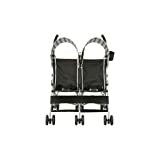 Also, the Twice Double Umbrella Stroller has reflective strips, so you don’t have to worry about visibility at night. Is it for you? If you’re looking for a stroller with a “real” bassinet option but without a car seat option, and want large, extendable canopies and extra storage space, this is the double umbrella stroller for you. The Maclaren Twin Triumph is probably one of the best double umbrella strollers out there. With an extendable canopy, storage pockets on the back and a basket underneath, this stroller also boasts a five-point harness and lifetime warranty. It also happens to be one of the narrowest strollers on the market (not that umbrella strollers tend to run wide). The good: The Maclaren Twin Triumph has a five-point harness, a storage basket, and four-wheel suspension. The not-so-good: This stroller isn’t cheap. The best part: This stroller – unlike most umbrella strollers – has a lifetime warranty and removable fabric which can be washed in the washing machine. Is it for you? If you have the money to spend, and you want a stroller that’s safe and easy to clean – this is the double umbrella stroller for you. The Maxi-Cosi Dana For 2 Double Stroller is great for parents who want a car seat-compatible double umbrella stroller that’s versatile, washable, and fully reclinable. This stroller can be used three ways: without car seats, with one car seat, or with both car seats. Also, it has two separate storage baskets. The good: The seat cushion and headrest are both reversible, and the stroller includes a cup holder for a parent. Also, the canopy is removable and extendable – though not as extendable as some of the others. The not-so-good: This is definitely not the most lightweight double umbrella stroller – and it’s not the cheapest, either. 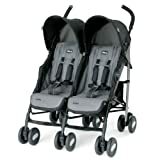 The best part: The Dana For 2 includes headrests and car seat adapters, and the cover is removable and machine-washable. And, it has a lifetime warranty. Is it for you? If you’re looking for a regular double stroller that folds umbrella-style, and want something that can be used from birth and can hold car seats, this is the double umbrella stroller for you. The UPPAbaby G-link Stroller is good from the moment your babies are born, offering headrests, foot barriers, and four recline positions. Plus, it has four wheels instead of six for better maneuverability, and removable fabric that’s machine-washable. The good: The UPPAbaby G-link Stroller has an extendable canopy, four recline positions, and a five-point harness. The not-so-good: Despite the fact that the UPPAbaby G-link can be used from birth, it doesn’t offer an option to attach car seats. Also, it’s slightly more expensive than the Maclaren, but has a shorter warranty. The best part: This stroller comes with a headrest and foot barrier for newborns. Unlike most umbrella strollers, it also offers a one-hand fold. Also, its fabric can be removed and washed in your washing machine. Is it for you? If you’re looking for a double umbrella stroller that you can use from the moment your babies are born, and have the budget for UPPAbaby’s G-link – this is the double umbrella stroller you want. 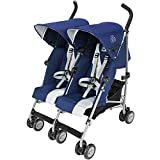 The Chicco Echo Twin Stroller is a popular double umbrella stroller offers four reclining positions, and adjustable leg rests. This stroller offers a five-point harness, as well as the option to remove the canopy’s back during the summer months, providing better ventilation. The good: The Chicco Echo Twin has a storage basket and five-point harness, as well as one cup holder. One reader wrote that her husband (6′) found it easy to push. The not-so-good: This stroller doesn’t have an extendable canopy, and while it’s not expensive, it’s not cheap, either. The best part: The Chicco Echo Twin Stroller has a carry handle, so you can lift it into your trunk with one hand. Is it for you? If you’re looking for a sturdy double umbrella stroller with a storage basket, that’s not cheap but won’t break the bank, this is the umbrella stroller for you. The Summer Infant 3Dtwo Double Convenience Stroller is a tandem stroller, with the width of a single stroller but able to seat two children: one higher up, in rear, and the other lower, in front. It’s main advantages? Both children have their own canopies, the stroller offers a carrying strap, and it has a lot of storage. The good: The front footrest is adjustable (as in, it can be pulled all the way up to support the child’s feet during a nap), and there’s a bumper bar to prevent kids from leaning over too much. Plus, each seat has its own canopy – which means more shade and fewer arguments. The not-so-good: This stroller can only fit one child in a car seat, and the company emphatically says it’s not compatible with car seats at all. Also, the seats don’t fully recline. The best part: The Summer Infant 3Dtwo has a cup holder, a rear storage pocket, a large storage basket, an auto lock, a one-hand fold, and a carrying strap. Yet it’s still an umbrella stroller, and lightweight at that. Is it for you? If you’re looking for a tandem umbrella stroller that won’t break the bank, has lots of storage, and offers a good price and great amenities, this is the umbrella stroller for you. For those parents looking for the most basic double umbrella stroller, the Delta Children LX Side by Side Tandem Umbrella Stroller is a simple yet popular model. While it has no storage basket, each seat has a storage bag in the back, and the stroller, weighing less than 19 lbs, is one of the lightest double strollers on the market. The good: The LX Side by Side is a popular stroller with fully swiveling, shock-absorbing front wheels and soft shoulder pads. The not-so-good: There’s no storage basket, this stroller can’t accommodate car seats, and the canopy isn’t full. 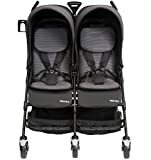 The best part: The Delta Children LX Side by Side’s biggest advantage – other than its price – is that it has a five-point harness: The other strollers listed in this price range offer 3-point harnesses only. Is it for you? 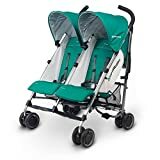 If you’re looking for a good-enough double stroller for your toddlers, and want it to be safe but cheap, this is the double umbrella stroller for you. The Kinderwagon Hop Tandem Stroller is a “tandem” stroller. It’s not side-by-side, but it doesn’t have one seat fully behind the other, either. Instead, the rear seat is slightly higher than the front seat, and placed slightly closer behind it. The end result is a stroller that’s easier to maneuver than regular tandem strollers, but slightly limited in options. The good: The child in the rear seat has a footrest and somewhat more privacy, and the footrest in front can be adjusted. Also, this stroller has a bar in front, preventing too-curious toddlers from leaning too far over. The not-so-good: The two seats aren’t equal: The rear seat can be used from three months and up, while the front seat can only be used (without a car seat) from the age of six months. Also, the child in the front seat has significantly less shade, while the child in the rear seat has significantly less air flow, sun, and leg room. It’s not clear if the seats are able to recline any significant amount. Is it for you? If you don’t want a side-by-side stroller, but still want the option of attaching a car seat, this is the double umbrella stroller for you. A popular, lightweight stroller, the Kolcraft Side-by-Side Double Umbrella Stroller has large canopies to protect your children from the sun, as well as a cup holder for the parents, and three handles instead of two. Though it can’t be used with car seats, the Kolcraft Side-by-Side is relatively inexpensive, perfect for toddlers and preschoolers up to 35 lbs each. The good: This stroller is lightweight, fits easily through most doorways, and has a cup holder on the handle. It also has three handles for greater maneuverability. The not-so-good: There’s no storage basket underneath, it can’t hold car seats, and it only has a 3-point harness. The best part: The seats’ thick backs roll up to reveal a mesh layer – perfect for warmer climates and summer weather. Is it for you? If you’re looking for a good double umbrella stroller at a low price, and live where summers are warm, this is the double umbrella stroller for you. Though the Delta Children City Street Side by Side isn’t as popular as the company’s LX model, it’s still a favorite among parents looking for a bargain. Like its sibling, the City Street is lightweight, narrow, and hanging storage bags. Unlike the LX, the City Street’s harness has only three points, not five. The good: The Delta Children City Street has a parent cup holder and two hanging storage bags. It’s a popular double umbrella stroller, especially with parents of older toddlers. The not-so-good: This stroller doesn’t have a full canopy or a storage basket, can’t accommodate car seats – and doesn’t have a five-point harness. The best part: This stroller has fully swiveling, shock-absorbing front wheels, and it won’t break the bank. Is it for you? If you’re looking for a no-frills double umbrella stroller at a rock-bottom price, and don’t mind a lack of storage space or a three-point harness, this is the double umbrella stroller for you. Umbrella strollers are lightweight, easy-to-transport strollers, but their major setback is that, very much like jogging strollers, they can’t always be used from birth. This is because many umbrella strollers lack the insulation and anti-shock mechanisms which protect tiny babies from impact (older babies aren’t as susceptible). Also, heavier babies don’t need heavy strollers in order for the stroller not to tip over whenever it’s touched. Tiny babies don’t weigh enough to hold an umbrella stroller that wasn’t built for them. What makes an umbrella stroller? You’ve folded an umbrella before: You push a button, pull down, and the umbrella folds into itself, creating a tiny footprint, able to fit anywhere. That’s the idea of an umbrella stroller. All umbrella strollers fold in a similar fashion, and all have a telltale set of bars on the back. These strollers are usually lightweight, and unlike other double strollers, are not necessarily able to carry heavy loads. While umbrella strollers fold compactly, and often easily, it’s not always a one-hand fold – sometimes it’s a one-foot fold. With an umbrella stroller, you’ll push two bars up in the back, allowing the stroller to fold into pole-like object (wider, obviously, for a double umbrella stroller) which can be easily placed in a corner – not to mention in the trunk of your vehicle. Another characteristic of umbrella strollers is the fact that they have two separate handles, one on either side of the frame (and sometimes a third in the middle). If a stroller has a single handle running its full width, you know it’s not an umbrella stroller: It cannot fold umbrella-style. Also, double umbrella strollers will often have six wheels instead of four (though you can find four, and they are often easier to maneuver). Here are some of the greatest things about umbrella strollers: You can get a strap and carry them on your back. You can almost always place them in your trunk or back seat, and carrying them takes one arm (or an arm and a half) but does not kill your back. It’s easy to umbrella strollers – even some of the double umbrella strollers – up and down stairs. And, both single and double umbrella strollers tend to run cheaper than their “regular” counterparts. Choosing a double umbrella stroller isn’t always easy. Here’s what to do: First, decide whether or not you’ll want to place your babies’ car seats in the stroller. Remember, you can buy a frame to hold the car seats, separately from the umbrella stroller, and not every car seat is compatible with these strollers, anyways. Plus, pushing two car seats can get heavy. Once you’ve made that decision, go through this list again and choose the double umbrella stroller that best suits your needs. You might want to check for special Black Friday deals as well. Whether you want machine-washable, fully reclining, or something cheaper, the right double umbrella stroller is waiting for you, right here on this list. Have something to say about one of these strollers? Know of one we missed? Let us know in the comments!